MIAMI-DADE COUNTY, Fla. - One man was killed and another was injured Saturday afternoon in a car crash in the Ives Estates section of northeast Miami-Dade County, authorities said. 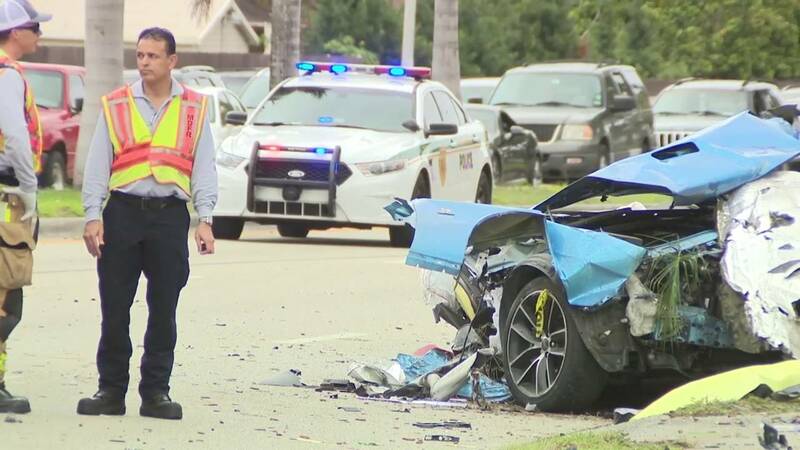 The fatal crash occurred around 2:30 p.m. at Ives Dairy Road and Northeast 10th Avenue, according to the Florida Highway Patrol. Troopers identified the victim as 23-year-old Joshua Gonzalez. State troopers said a white Ford F-150 was heading west on Northeast 10th Avenue, attempting to turn south, when it collided with a blue Dodge Challenger heading east on Ives Dairy Road. "I heard a boom and ran out of the house and saw the smoke," resident Chris Carter said. The blue car hit a traffic light pole and then a palm tree, which caused the car to split in two, killing Gonzalez, officials said. Christopher Mathews told Local 10 News he was driving his car when he witnessed the crash. "The blue Charger was coming from this way, with a head-on speed going that way, hit the pickup truck," Mathews said. "This one is one of the baddest accidents I've ever seen in my life, to tell you the truth. I've never seen a car split in half." Paramedic transported the driver of the white truck, 59-year-old Jose Castillo, to Aventura Hospital and Medical Center. He was listed in critical condition. "It is horrible. I can't explain it to you," said Nory Santana, a witness. "It is very, very scary." Other witnesses Local 10 News spoke with were still shaken after seeing the crash happen right in front of them. "I called the police. Everybody called the police," Santana said.